Guatemala is also known as: “The country of eternal spring”. It is found in Central America, boarding Mexico to the north, El Salvador and Honduras to the south/east, the Pacific Ocean to the west, and the Atlantic Ocean to the east. The republic has an expanse of 108.000 square meters with approximately 13 million inhabitants. The topography of the country is diverse, the majority made up of mountains. It is also one of the most culturally diverse countries in the world, boasting assorted flora and fauna, a varied climate, 24 ethnic groups and 24 languages. Spanish is the official language and is spoken by the majority of the population. There are many excellent reasons to visit, travel and study in Guatemala. Traveling is actually very easy and cheap (accessible for any budget), there is sufficient infrastructure, and it is not a problem to find transportation, hotels, restaurants, and other necessities. The climate in Guatemala is very diverse. One can go from the warm plains of the coast to the cold mountains of the plateau, characterized by 30 different volcanoes, or to the tropical jungles of the Petén region. 4 hours to Guatemala City, 3 hours to the boarder of Mexico and 1 hour to the Pacific Coast. 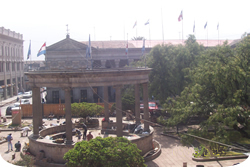 Quetzaltenango, which was founded in 1524, is one of the oldest cities in Guatemala. Quetzaltenango is commonly called “XELA” (pronounced: shay-la) by travelers and the locals of the region. It is the second biggest city in Guatemala and one of the main historical centers in Central America, with architectural buildings that date from the XVIII century. Quetzaltenango is located in a valley surrounded by mountains and four major volcanoes: Santa Maria, Siete Orejas, Cerro Quemado, and the active volcano Santiaguito. Quetzaltenango is a city proud of its cultural inheritance, and for this reason it is considered by many to be the cultural capital of Guatemala. Unlike other cities such as Antigua (Guatemala), San Jose (Costa Rica) and San Cristobal de Las Casas (Mexico), Quetzaltenango has not had an excess of tourism and can be characterized by the hospitality and warmth of its inhabitants. For this reason the city is considered an excellent location to learn Spanish and provides a complete immersion experience in the language and the culture, with its customs and traditions in their authentic form. Quetzaltenango is an active city, full of life. Visitors will find many service options: accommodation, churches, hospitals, clinics, bookstores, supermarkets, traditional markets. Quetzaltenango offers a variety of information: bars, discotheques, cinemas, theaters, Internet cafes, sport centers, gymnasiums, parks, outdoor concerts, soccer games in the stadium, while those that wish to leave to explore will find eco-tourism and organizations which offer hikes and camping throughout the mountains. Near the city are hot springs and natural steam baths, mountains, volcanoes and farms where it is possible to enjoy nature. Around Quetzaltenango there are many towns with Mayan populations. While you are walking through the streets you can see descendants of the Mayans dressed in their traditional colorful clothing, selling fruits and vegetables and speaking in their native languages. Quetzaltenango is warm during the day and sunny almost all year long. High temperatures never exceed 30 degrees centigrade or drop below 21 degrees centigrade. During the night the temperature will generally fall to 10 degrees centigrade; generally September is the rainiest month of the year.